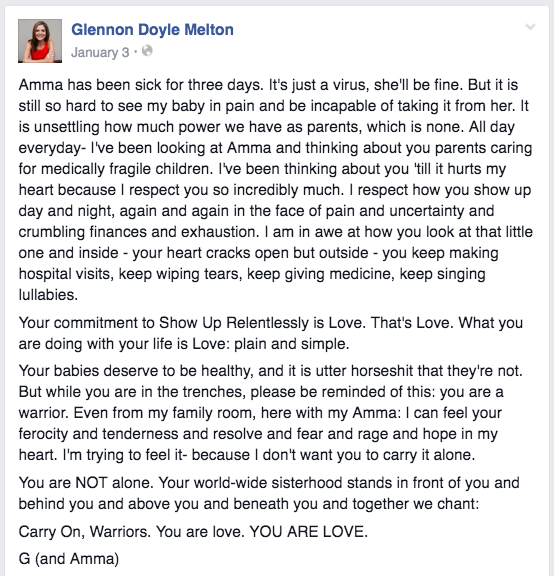 A few months ago, Amma got sick. She was sick for a week — the kind of sick that means really high fevers and fear. I held her for days and kissed her hot forehead and all I could think about was how lucky we are. Because it was a hard time, but I knew she’d get better. So as I held my Amma — half my heart was with her and the other half was with you parents who spend your weekends and holidays in hospitals, who hold your babies while they cry and can’t promise them: you’ll feel better tomorrow, honey. This is how gratitude is for me: always a little bit painful. Because when I am grateful for food, I always remember that someone’s hungry. When I feel grateful for family, I always remember that someone is lonely. When I feel grateful for peace, I always remember that a mother somewhere holds her baby in a war zone. I think: I am so grateful I have this. I so badly want this for everyone. I am starting to wonder if love and pain are the same thing. I can’t seem to feel one without the other anymore. Life is brutiful. I kissed Amma, and with one arm still wrapped around her — I wrote this update. And then I watched as the comments starting coming in. Parents started leaving their babies’ names. Name after beautiful, beautiful name. And I sat for a while and cried. I felt such deep compassion. 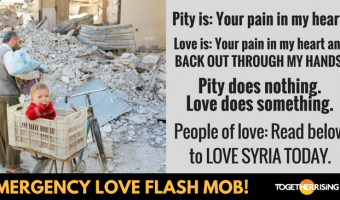 Not pity. There was no pity. You don’t pity an army of warriors, for God’s sake. You just stand quietly in reverent awe of how hard life is and how brave people are. My heart just broke open wider with each new name that appeared on my screen. God. Heartache is a signal to you that you’ve stumbled upon something worthy of your life. Do not run, do not turn away: follow your heartbreak. The broken road is the road less traveled. Take it, walk it, it will make all the difference. Everything beautiful starts with a broken heart. So I just sat and stared and let my heart break for a while. And then — this is what happened: this is what ALWAYS happens when we are still with our pain — it becomes fuel. My hands started to feel restless. I felt the desire to DO something. Ah yes — I remembered: compassion is not Your pain in my heart. That’s pity. Pity helps no one. No, compassion is your pain in my heart and back out through my hands. Feelings are just energy. Eventually — we have to make something with them. But our work isn’t about what we get done — it’s about what we become. Spending a day writing all those names made me BECOME something different. It made me a sister to all of those mothers. A mother to all those babies. It made them kin to me. And the Kingdom of God is that realm in which we live like every last one of us is our family. Like we actually belong to each other. I have to believe that We Belong To Each Other. I have to. And so every day, I find ways to make that REAL. We have to earn that belief. It doesn’t just fall in your lap. We don’t really BELIEVE something is true until we are actively making it true. My friend stopped by five hours after I started this love project and she said: lord. 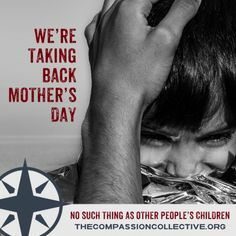 You are so loving to do this for them. And I said No, no, no. I don’t do these crazy things because I’m loving. I’m loving because I do these crazy things. Love is not a feeling. Love is the result of hours and days and years of using your hands and heart and mind to show up in a million different ways for other people. We don’t wait to act until we feel loving — we act so that we will feel loving. You don’t wait for love – you create it. During hour four of name writing – a message came into my inbox from a woman I follow on IG but have never met. She runs a feed called Liss Letters and she does gorgeous lettering. She’d been reading all the names, too. And her heart broke and she did not run from it – she made something with it. 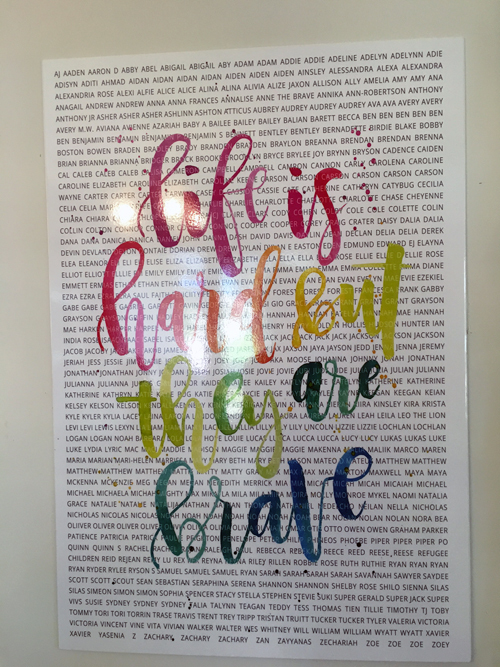 She sent me a beautiful printable with the quote: Life is hard but they are brave. And as I looked at what she sent I realized what needed to be made. A family roster with all our babies names that I could hang in my home. So I started typing up my handwritten list. I typed up every single name and by dinner time I was done. I sent the list back to Liss and asked her to add the names to her art. She did. She sent it back and it was so beautiful. I sent it to Amy and she turned it into a poster for me. But then, the next day — a woman wrote to me. A woman whose baby couldn’t be on our list because she already died. G, Will you make another poster? She asked. With our babies’ names? With the names of the babies’ who were taken forever from their parents’ arms? So, then — I collected those names. Our team could barely communicate with each other that day. And Liss Letters helped me make this poster. The quote is from a mother who wrote four hearts and then the words: I ache. The hearts on this poster symbolize babies who were taken before they were named. And I looked at her four hearts and her: I ache and I thought: There is nothing I can do about your ache. You will ache forever. But there is something I can do about the I. I can make it a we. 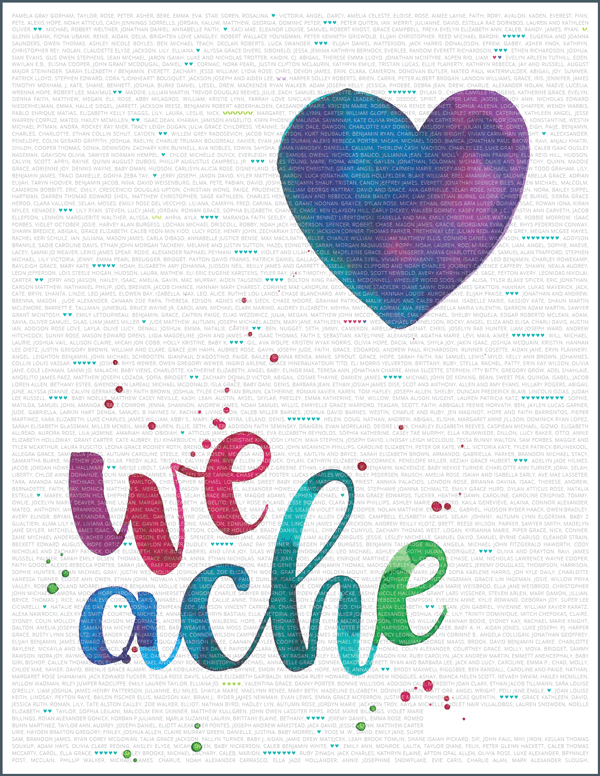 We will ache with you. Your sisters and brothers will ache with you. These posters are on my wall now. They are the first things I see every morning. Sometimes when no one’s home I say their names out loud. My kids pray for them at dinner. They are with me early in the morning as I write and late at night as I wrap up for the day. These babies are mine too, now. Ours. They have become real to me. Your babies are our babies. And I stand in awe of your love and pain. It’s not fair that your baby was taken or that your baby is sick. It’s not fair. I’m so sorry. Just know that you are seen and you are not alone. We ache with you. My loves: print these out. Add the names you need to add. Hang them on your wall. Say prayers for them or send energy to them or read them. Teach your children that you hang these names in your home because home is for family — and we are all family. 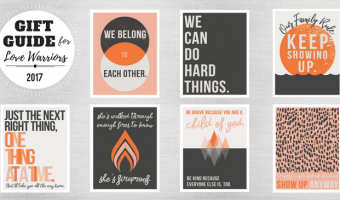 Teach your children what a sacrament is — and build a home full of them. A home that says: this. This is what we believe. So this is what we DO. What do you believe to be true about the world?? What can you do today to make it real? On Earth as it is in heaven?? I Love You and your children. For REAL. Next →You Are Saving Lives. 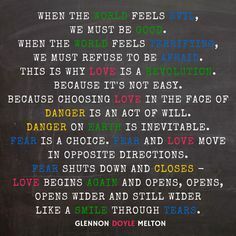 This IS The Love Revolution. Don’t Miss This. Oh, you are such a rare and beautiful soul. Thank you for sharing you, with the rest of us. Beautiful, heart breaking. I am among those that care for a child with multiple disabilities. His name is Alex. Very touching to have someone speak so opening and so loving about children they don’t know with total acceptance. great post, thanks for sharing, I loved your blog, I will keep visiting you. What a touching article! My heart goes out to all who have lost babies or nursing sick kids. I salute your courage and like Glennon says, you’re not alone. We’re in this together. I also lost a child at birth. I have gone on to have kids but I wonder how I survived that period. It’s a harrowing experience. One that I’d never wish for my enemy. I feel the same exact way! 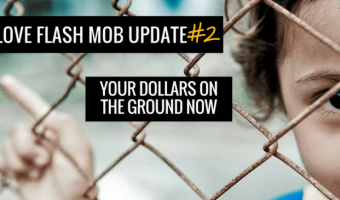 My son dealt with a long ordeal with a broken foot and while in his world, it seemed earth-shattering, I knew it was nothing compared to what others were dealing with. As much as I don’t want my kids to suffer, I also know that suffering creates grit, compassion, gratitude, and strength. Oh, the agony of parenting! We want to protect them and keep them safe but not so much that they become fragile and delicate to handle the heaviness of what’s to come. This was so beautiful and I love that you wrote each and every name. Everyone matters. Three years ago today I called my doctor’s office because my 38 week old baby wasn’t moving. They asked me to come in because although everything was probably fine, they just wanted to see me. Everything was not fine. I will never forget looking up at the ultrasound screen and seeing a little black blob where her heart was supposed to be beating, only the black blob wasn’t moving. I didn’t need the doctor to come in and tell me that my baby had passed, because I already knew. The next day I reported to the hospital to be induced. After 24 hours of incredibly difficult labor I gave birth to my 8 lb 14 oz 20 inch long beautiful baby. We had chosen not to find out if we were having a boy or girl, so we learned for the first time that our baby was a girl. We named her Audrey. When she was born the reason for her passing was clear: she was wrapped in the cord so badly it had cut off major arteries. She was otherwise perfectly healthy. We held her as long as we could before she had to be taken away. We chose to have her cremated and her remains are in an impossibly small urn that fits in the palm of my hand. My heart aches every day. Every. Single. Day. To all parents who have lost a child, I cry for you every time I cry for me, and my husband and my little 4 1/2 year old who never got to meet her little sister. I love you my sweet baby Audrey! I recently went to visit my grandmother (I live in Georgia and she’s in New Hampshire), and it was really the first time I got to know her as an adult. I learned that she had a stillborn baby between my dad and my uncle. In those days, women were put under anesthesia for childbirth, so she never saw the baby and didn’t find out until the next day. My Nana said that even though it’s been 60+ years since she lost her baby (Jane Elizabeth), it still ranks right alongside the pain of losing her husband. Thank you for the beautiful gift you’ve given our community, Glennon! Thank you for this, I was addicted at some point in my life but I wanted to do better for me and for my family so I started looking for help online, I found articles like this one, that is when I choose to join a rehab center, thanks to people like you i can say that I am cured today, thank you for making this happen! I am grateful for you, Glennon. Like “crying at my desk at work while I read your blog” grateful. Because maybe, no matter what everyone around me is saying with their accusing words and disapproving scowls, maybe I’m not wrong about what love and family are and what it should look like to be Jesus for each other. Maybe I’m not wrong. Because you agree. You speak the words of my heart, the whisper of Jesus within me, and you reaffirm that yes, love IS supposed to be big and love IS supposed to show up and love IS the only thing we’re even freaking here for, so we better make it count in all the right ways! And so… thank you. This is so so beautiful s2 Thank you for this article! 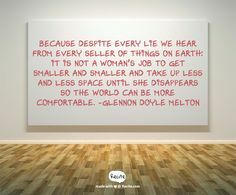 Glennon: Christ you’re in inspiration and I love how you went with this and what has emerged. Incredibly beautiful and incredibly powerful. Thank you for inspiring me to DO. My sweet baby, Esther Kate, was born without heartbeat two weeks ago tomorrow. I was almost 36 weeks pregnant and cannot begin to comprehend that this is my new reality. I am the mother of a baby with whom I do not get to experience life. My grief is so fresh I do not yet know how to exist. 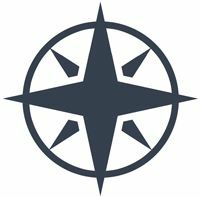 A friend sent me the link to this blog post to let me know that I am not alone. I feel alone, but I know I am not. Oh Lucinda! I’m so sorry! We are here with you. You are not alone. We love you and we love Esther Kate too. Prayers for you – right now. My heart breaks for you & Esther Kate. No words … just tears and love. You are not alone. I promise to think of you and pray for you often. my heart breaks for you, my eyes tear for you, my stomach turns for the pain you must be feeling. i am so so so sorry for you and sweet Esther Kate. Dear Lucinda, I lost my youngest child, Leo, nearly three years ago. It was so important for me to go to counseling and to find a group of people who understood. I got so tired of hearing people say, “I can’t even imagine.” The thing is, we can imagine, and most of us run away from the thought. Having people who truly understood what I was going through kept me alive. I went to Compassionate Friends and I found some support groups on Facebook. One I am part of actively is called Grieving Your Youngest Support. Another is Grieving Mothers. My heart is with you. I’m so sorry that you don’t have your Esther Kate with you. This kid…THIS KID! The one mean muggin’ at the lunch table is Star Student in his first grade class this week. Every day this week Jamie got do something special, share something about himself, and be the star in the classroom. This past summer we moved, and the boys started at a new elementary school in the fall. Unlike last year in our old neighborhood, where Jamie already had friends and many already new about him having Type 1 diabetes, this year he didn’t know anyone going in, and no one knew him. Last year in kindergarten he was very open about his disease and had no problem sharing it with his entire class. This year, he didn’t want to draw attention to it. He didn’t want the kids to know about it, and he tried his best to keep it “on the down low.” We honored his decision, but here’s the thing about diabetes, you can’t keep it on the down low. When you’re having your glucose levels checked multiple times a day with the school nurse or aid, kids see it. When your Mom moves quickly into the classroom, tries to quietly get down your emergency supply of food from it’s cupboard, and takes you out to test your glucose levels because she sees on your Dexcom that you’re running low, kids notice. When you’re sprinting down the sand field to kick the soccer ball in for a goal, the belt around your waist that holds your insulin pump, Dexcom, and phone bounce around and sometimes show from under your shirt, and you can’t hide it. When kids notice, they ask questions, and they are understandably curious. They may whisper about it to each other, and or ask you directly. They want to know what you are doing, what that thing on your arm is, where does that tubing go, why can’t you participate in PE or recess (which is always due to a low glucose level). So when your a new kid at new school, and you’re trying to just “be normal”, and make friends, you don’t want to stand out as being different. Jamie wouldn’t let us come into the classroom this year and read our book to the class called “Taking Diabetes to School.” He shot me the death stare when kids would as me about it while I was volunteering, or testing him before a snack, and I tried to discreetly explain what I was doing. There were even times where he would ignore a low glucose level, or turn off his dexcom, because he didn’t want the kids to see him leave the calls. There was no way he was going to talk about diabetes…until today…UNTIL TODAY!! One of the biggest blessings about our move has been the new school the boys go to. Jamie is no longer the only diabetic. There is also another older student with diabetes at his school, so the school nurse, teachers and staff were all ready when Jamie arrived. Having a diabetic student wasn’t new for them, and they had procedures already in place. It get’s better…one of the front desk staff has a high schooler with T1D! 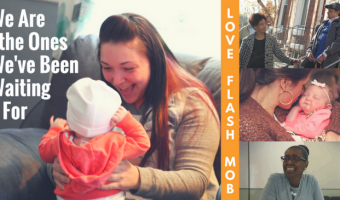 She’s been a Mom to a T1D kiddo even longer than Jamie’s had diabetes, and she has been such a great support to Jamie and our family. Today, this amazing staff member Mrs. H was talking to Jamie as we arrived to school late. Mrs. H knows that Jamie has been embarrassed by his diabetes, and hadn’t shared it with the class. She told Jamie that every year when her son was little she went in to class to read the book and explain about her son’s diabetes. She said that by the time her son was in 4th grade, pretty much all the kids at school knew about it, and it wasn’t a big deal. The kids didn’t whisper about it, because already understood about the disease. “What better way to end your Star Student week then to share with the class about yourself, and let you Mom come read them the book, so they won’t wonder any more and it won’t be a big deal.” she said. Jamie looked at us both, and said, “Ok!”. I was shocked! Jamie and I went to class. As soon as I finished my volunteer work, I went home to get the book. Right before lunch, all the kids came to sit on the carpet. Jamie’s teacher told the class he had a special presentation to end his Star Student week. He and I sat in chairs at the front, and this kid..THIS KID…explained to the class about his diabetes!! He told them the difference between Type 1 and Type 2, he was calm, he was informative, he was AMAZING! I read the class our book, and the kids got to ask questions. Jamie was sitting there like a rockstar with the biggest smile on his face answering all their questions. The kids were so interested that we had to take our discussion to the lunch room because we ran into lunch time. All the kids in his class were crowding around us at the lunch table. We looked up islet cells (cells that produce insulin) on my iPhone to see what they look like. Jamie showed them all the pictures, beaming from ear to ear. It was a circus at the first grade table, and I may have gotten in trouble for taking these pictures, but you know what…I DON’T CARE!!! Because today Jamie was the STAR, today he didn’t feel different or like a “freak show” as he sometimes refers to himself. Today he felt special, he felt accepted, he felt proud. This boy and his brothers are my stars every day, even on the days when they drive me crazy, and even on the days when caring for his diabetes beats me down. However, today was Jamie’s day to shine. This disease and all it’s difficulties didn’t win today…HE WON TODAY! So, thank you to Jamie’s wonderful support team at school. His teacher, our aid, our school nurse, and Mrs. H because they have all helped my boy get to this day. This star student couldn’t have ended his week any better. When I left this afternoon, Mrs. H and I hugged goodbye. With tears in both our eyes, we held on to each other because of the special connection we share, and I walked to my car with my heart full and my spirit lifted. If you’ve actually read this incredibly long post to the end, then you are amazing! wink emoticon Thanks for indulging my verbosity and letting me brag about my kid. Happy Friday!! Carmen, you made me cry happy tears at work. I was a sick kid who didn’t want to be a “freak show” at school either. I’m so glad your son’s friends and school are accepting and helpful! And a big HIGH FIVE to you Mama! You’re doing a great job! 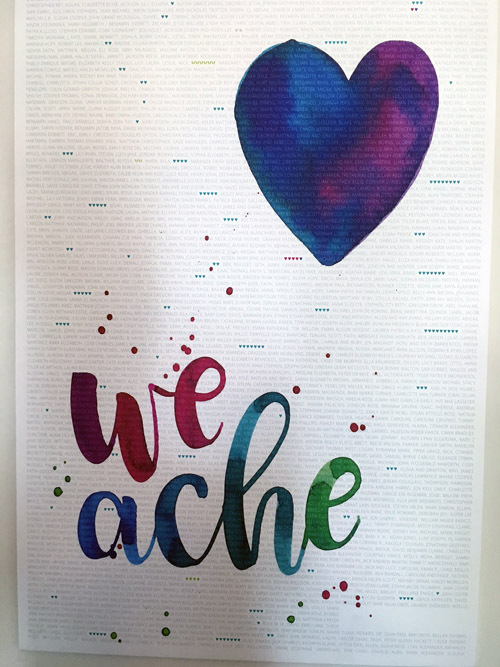 I see my boys names on the We Ache poster, Jerry Joseph and Jaxon David – twins. They were born at 24 weeks and 2 days gestation. Jerry developed without a heart and was considered stillborn at birth. Jaxon fought hard for 7 weeks before going up to heaven. We spent countless hours at the hospital holding on the only thing we had – HOPE. Thank you for honoring these babies and families. God bless. This is just so beautiful. I thank God for people like who. People who take the time to smile & talk not stare as they walk by & whisper to themselves. We’re always in & out of the hospital. It’s been a rough winter. My son has a rare heart condition. I promised him we would fight everyday with him so he’s never fighting alone but his strength amazes me. He’s 15mo now & is a twin. His twin aches when brother is sick. You can feel it. My son’s name is Xayvier Jordan Torres & besides his heart condition he’s also been diagnosed with digeorge syndrome. Please add my Xayvier to your prayers. Your poster if possible. You can follow him on fb #teamxayvier again this is beautiful. I plan on hanging in my home as well! God bless you always. Going off a little to say that if anyone does go to McDonald’s, you can donate to the Ronald McDonald House in good conscience. Both my mother and I have been there. What a Godsend. Thank you so much. My son is on the first poster. It means very much to me and my family. Thank you! My daughter’s name is on that first poster. Tears of thankfulness, joy, and at the same time heartache for all the names on those lists. I will definitely be printing this out! Thank you so, so much. I love you so hard. My son Noah, now 14, has had health issues since he was 2 weeks old. First, widespread eczema. When he learned how to scratch his feet, we covered them in socks. They would be soaked with dried blood by morning. That, we were advised by our pede, was a warning for future asthma (2 yrs old he got his nebulizer) and food allergies. He had his first anaphylaxis attack at 3 after one bite of peanut butter–he must carry an epipen at all times for his life threatening egg, dairy, nut, and shellfish allergies. And he got glasses at 6 months. Later he was diagnosed with mild aspergers (thankfully he’s also highly gifted), dyslexia, color blindness, migraines, and a rare variant, cyclic vomiting syndrome. We hold our breath that the med is working to keep the vomiting away–he would be out for 1-2 weeks at a time. Now he mostly battles migraine–he’s been home all week in a dark room with an ice pack. I have my own laundry list of health issues so he comes to me for advice how to cope. He’s learned to be incredibly compassionate. He told me one day how his food allergies were no big deal compared to his friend with diabetes. Despite all this he is a happy, sweet kid, surrounded by friends who all know how to work his epipen. Even his girlfriend has one. Our first born is blessed with good health and has always looked out for her brother, whether it was reading ingredients for allergens or creating new recipes that he could eat, even finding restaurants that are allergen friendly. My heart hurts for all the mama’s with kids who are sick, or who have gone to the arms of God. I love you all and pray, and try to find my own ways to help that pain end or at least diminish. I love you my sisters. Hi Krista – my name is Lori Kemmet and I am a dentist in Colorado. As a dentist I have a huge desire for learning especially as it relates to children and airway. Many asthma, ADHD, and sleep apnea diagnoses can be help by nasal breathing. When possible guide all your children to nasal breathe (close the lips). This nasal breathing will actually decrease inflammation and increase oxygenation to the body. There is so much more to say and if you would like further information please read: The Oxygen Advantage by Patrick McKewoen. The basic premise is this: Healthier people nasal breath. The sick one becomes the more he or she breathes out of their mouth. LOVE. And me too – always gratitude mixed with pain and brutiful empathy. 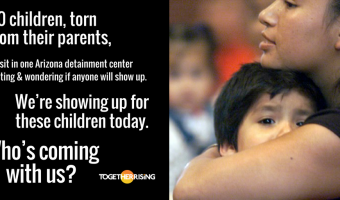 My heart breaks for those on both posters, my tears flow for the heartbreak, fear and agony their mothers feel. And yet my knees bend and I cry out to God with so much thanks, for His grace and mercy – and for hope. Hope, most of all. beautiful….sitting here crying at work. Thanks G.
Printer help, please — my printer will only print a tiny fraction of the poster. I don’t have a printer that can print a huge poster, so I also tried shrinking the scale, but all that does is print the same tiny fraction a lot smaller overall. I love you all so much, and all these babies. Life is hard, AND they are brave. Glennon, I’m in tears over the live in this message and this act. I’m so grateful you have these for download. I have a baby on each of them. Thank you for putting something so beautiful together! All the tears. My baby girl Jolie has a seizure disorder. She can have between 10-30 seizures a day. She has been in the hospital 13 times in her small life. She will be 3 in May:) thank you for this. You are awesome and from another special needs mom thanks for the prayers! I love these but was sad that my own little medically fragile pumpkin wasn’t listed. She could certainly use the prayers. If you do another version, please please add my sweet Annabelle Lee to it. My mom is driving to be with my sister whose ovarian cancer has returned for the 3rd time. She is 54 with a 19 year old daughter. Mom is struggling to make sense of it all. I thought of all the mothers who lose their babies, no matter their age. I don’t have any angel-babies of my own, but my best friend and my own mama do. We ache for Kevin, Titan, and <3. And right now, I have been given a wonderful gift. When your medically fragile children have to go to the hospital, I am there, trying to make life a little better but heartbroken that I can't do more. I can't take away the pain. I can't cure the illness. But I can love your precious babies. And I DO love your precious babies. I am blessed to be near them for the short or long time that they need extra medical help. I hear you. Life is hard, but they are brave. I see how brave they are. I see how brave you are. I'll keep aunt/nurse-ing on, sisters. Thank you, Brittany, for all you do. My Mom is a retired nurse and I know what a challenging but rewarding job it is, through her. You are an angel in scrubs! Glennon, thank you, what a beautiful thing you are doing. This has reminded me of the women in my small Brooklyn neighborhood who came to me after I suddenly lost my five year old daughter two years ago. ” You do not know me, but I am a mother and I am here for you.” This is indeed the love which holds us up. Two years , and many are still there for me and let me know they ache with me whenever I see them. If you ever make another poster, please add my beautiful Susanna’s name if you can. I had the worst day today and now I’m all teary. I’m teary because the beauty and pain I’ve found through this shows me that everything I was worried about doesn’t matter at all. These babies do. The fact that you’ve taken them in as your own is extraordinary. It’s everything I want to do in life. I may not agree with you on everything (but I love you) but I do agree with you on this. That is one of the most beautiful things that I have ever read. As a mother to two healthy daughters, I feel such a sense of awe towards the parents of children with medical fragilities, and the strength of those children always amazes me. Thank you for these beautiful pieces of art. 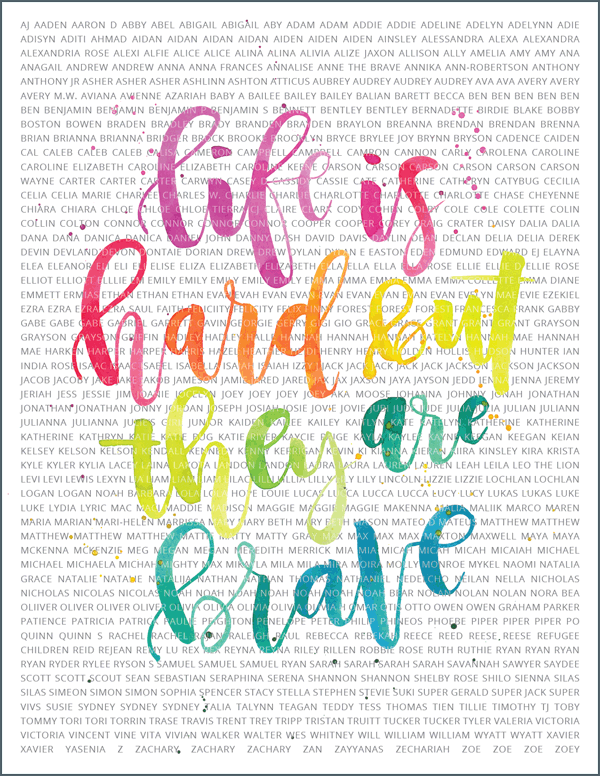 I see my niece’s name, Meredith, on the “They are Brave” poster. I’m so pleased that I sent it to you and now our family can see it here, too. This is wonderful. xox You do GOOD work, G.
Zoey. My fighter girl. Last name on the list. Down syndrome, major cardiac repair, stroke inutero, catastrophic form of epilepsy and for a fun chaser, leukemia. Our warrior child. The axis from which we turn. Our beacon of hope. And on the other list, our granddaughter Grace. Born sleeping and already in the arms of God, two days before her due date. We speak her name. She was here. We remember her for always. Thank you for all that you give. For all that you do. For this community you have built. Thirteen years ago I lost baby boy twins at 16 weeks after getting pregnant through IVF. We didn’t know what to do or how to grieve. It was more than a miscarriage but not quite a still birth. We did not name our boys or hold them or bury them. That time is a blur to me. We went on to do IVF again & now have two daughters. My life is full but at times I still ache. I feel I didn’t love enough to name, hold or bury my children. I have often wondered how to memorialize them. Now, I will print this poster and count my boys as two of the hearts. Thank you for helping me honor my boys. I’m a person who has a lot of faith in love and the universe and the things that tie us all together, and for me that is a big part of what God is. I really appreciate this post and your previous posts on faith because it makes me feel included even though I don’t participate in a religious community. I am sending my Auntie love to all the mommas and babies here and in heaven. Thank you for being a reflection of the kind of Love God wants us to show. I love what you are doing Glenna. Living the compassion. Sharing the aching. I love what Angie said about what she thinks God is, and I’m going to copy that for my inspiration reference. Also how Angie thanked you for being a reflection of the kind of love God wants us to show. Beautiful. Inspiring…all of you. When you asked about the babies we didn’t get to name, I wasn’t able to bring myself to comment. I have four. They left me 11/11/11, 2/22/12, 11/22/14 and 5/7/15. Thank you for your prayers and acknowledgement of them. Love and hugs and kisses for your four sweet <3 :'(. I need someone to know. Weed is the only thing keeping me alive, but it’s also my killer. I’m so fucked up right now and I am so scared. I don’t know why I am writing this here. I think I just need to admit that I am not okay. I know that it is killing me, but I think I need to go smoke some more. Lin – I am praying for you right now. It took such courage to reach out like you did!!! You are being gently held in love and grace. What can we do to make you feel less alone and broken right now? Lin, can you go to your doctor? Or a church, synagogue, mosque? Call a friend? Take yourself to the hospital? Does it help that we’re all fighting something? Praying. Praying. Please, go get help. We need you. I have helped many who feel as you do. I work with teens and young adults but am trained in counseling. If you need help, call me at 575.744.3768. Lin, we love you. We hear you. 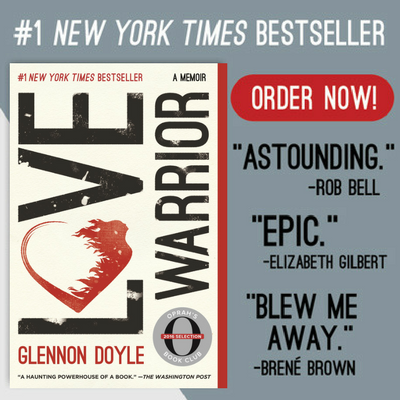 Read Glennon’s book. Do the next right thing. And then, do the next right thing again. Wish I could hold you and tell you it will be okay, but my heart goes out to you, and I am telling you that it will be okay. If you are strong enough to write this, then you have ALREADY taken the first step. Take another one. The desire to live again is enough, I think. You are living, and you can keep living. Thank you so much for taking this step. Take another one. We are with you while you take it. we love you lin!!!! just as you are! You are not alone Lin. I’ve been where you are. We love you, Lin! You are so brave, warrior friend. You do not have to keep fighting alone! Standing with you in prayer right now. P.S. I am pretty fucked up too, so don’t be so hard on yourself. We are all in this together. Love you. You have declared, “Not this.” You can take control and change this. We are with you, you are not alone. You guys, I did the bravest most terrifying thing I’ve ever done. I said, “Not this.” And then I dialed 911. I was seconds away from swallowing all my pills. I’ve spent the last three days in a psych ward. It was horrible and wonderful. I think learning about yourself typically is equal parts wonderful and terrifying. Thank you so much for your comments. I love us. I love that you were the first people I turned to when I needed help. Lin – your statement “I think learning about yourself typically is equal parts wonderful and terrifying” shows that you have something big to give to this crazy world. Please do not give up on your journey. Seek out the comedy of life and the wisdom in music and then slowly, the pain will subside. Before I got to the end of the post, I was going to ask you for a copy of the posters to hang in my home. Thank you. Thank you. 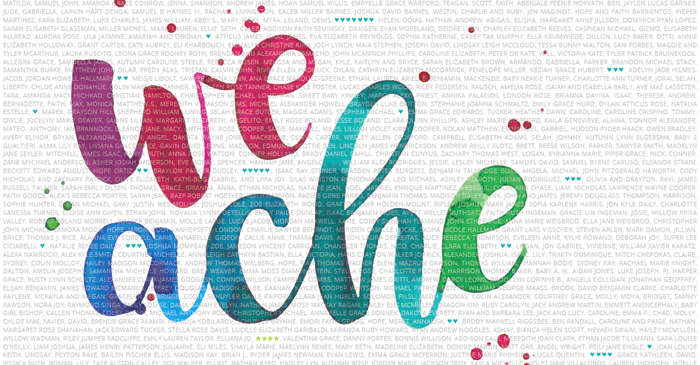 My little boy is right at the top of the pink E in the “we ache” one – Isaac James. He died at birth in July of 2015. 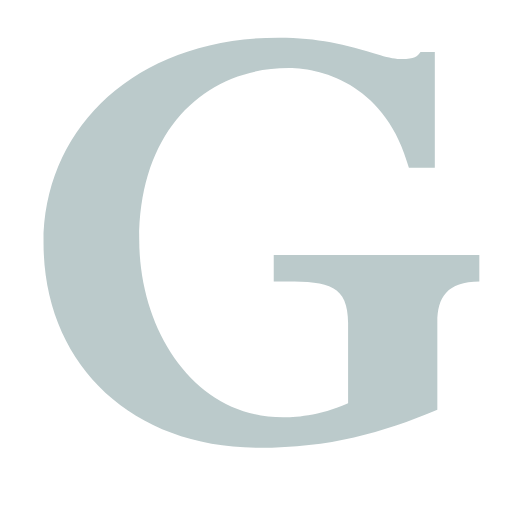 G, I met you the week after you put out the call for names. My Sawyer is on your list now. I had one of the worst weeks of my life. Sawyer screamed day and night as seizures wracked through his 6 year old body over and over. He clutched me and held me like a little monkey. I couldn’t even get up for a moment to pee. 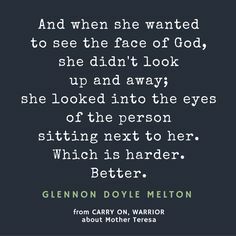 I held on that week knowing that I was going to get a night of reprieve, seeing sisters and you at a women’s retreat in Kansas, while my husband took a turn with Sawyer for a whole day. And then, I got to meet you. I was a blubbering mess. I had pulled myself together, put on make up and was with friends. And I wanted so dearly to tell you what your list meant to me. Instead, I had this moment where no words would come. I blubbered, I made no sense. “I, I, you, ….” That was what kept sputtering out. The best that I got out was, and “my son – your list….” You hugged me and smiled so sweetly, having no idea what I was trying to say. I didn’t get to say what I wanted to say. Here it is. 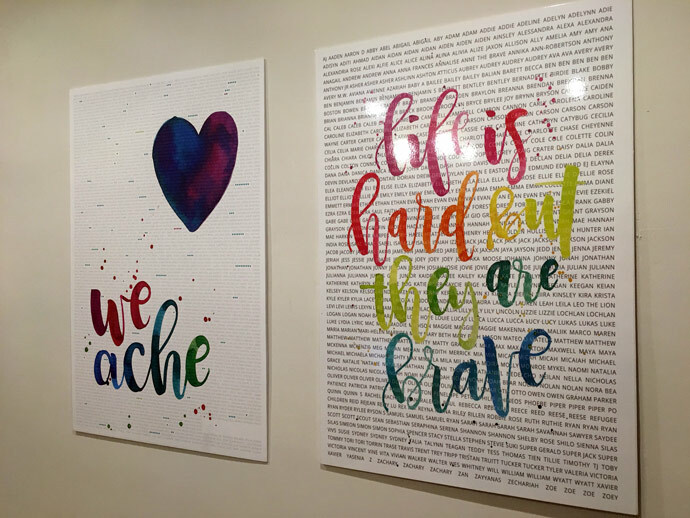 Thank you for seeing the pain and the beauty of having little ones with chronic issues. Thank you for holding us in your hearts and allowing us to hold our sisters. Can’t wait to print out your poster. I so get the beauty in gratitude. We went to the hospital again the day after the conference. 2 days of testing led us back to more meds and he is doing better now. I feel so lucky and blessed to have the reprieve and as much as I don’t want my little to suffer, I feel so blessed to have the reminder and glimmer into the world of mamas that do this day in and day out without a break. Thank you G.
Oh my God this is absoluty woderful. It made my eyes tear meanwhile I read it. I truly admire your sensibility. You made me feel im not alone. Ill pray for them too. I did lose two babies, many years ago, to miscarriage. But what really hurts, is losing my big sister to suicide, just one year ago. Her depression killed her, just as cancer kills. A terrible and painful disease. 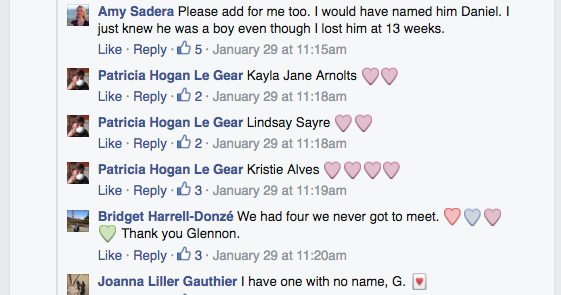 Sadly, if you posted about loss to suicide, your list would be as long as these children and unnamed baby lists. Show Up Relentlessly. My life’s motto. 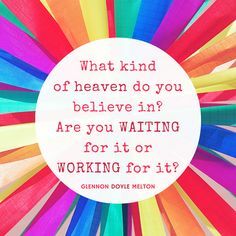 Elisabeth Elliot called it “do the next thing”. That’s how she says she endured the loss and challenges in her life. I am a mom of 7. 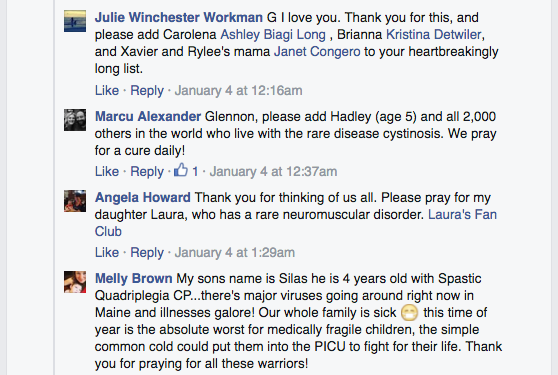 Three of my crazy kids have cystic fibrosis. When the first one diagnosed (my fourth kid) came home from the hospital, I wept for the loss. The loss of the assumption that everything would be fine; that I would outlive my kids; that I could handle parenting. Five years later, my second son, Jesse, a perfectly healthy child, died in an accidental drowning at age 8. And I ache. Every day eleven years later. But something loosed in me. A wild freedom from fear and a refusal to be defined by illness or medical treatments or hospital stays or WORRY. It’s liberating to know, in a real and immutable way, that pain is inevitable. It’s coming. To my family and to your family. It might be divorce or addiction (I dealt with those too with my ex), or failure or struggle in your kids lives. But learning that love is the promise has loosened my grip on my life and on my heart and in what I expect from God. I am freed to take the hand of others in this pain and know that though I ache and rage and question and swear, love will not falter. Kelly, this is going up on my wall in my dining room. I walk on a path with my son on the autism spectrum, as do my other two kids and husband. It is a path that will only end in Heaven, for all of us. But I won’t give up-we all, including my Asperger’s boy-show up relentlessly. Thank you for those beautiful, hard words. They are whole. 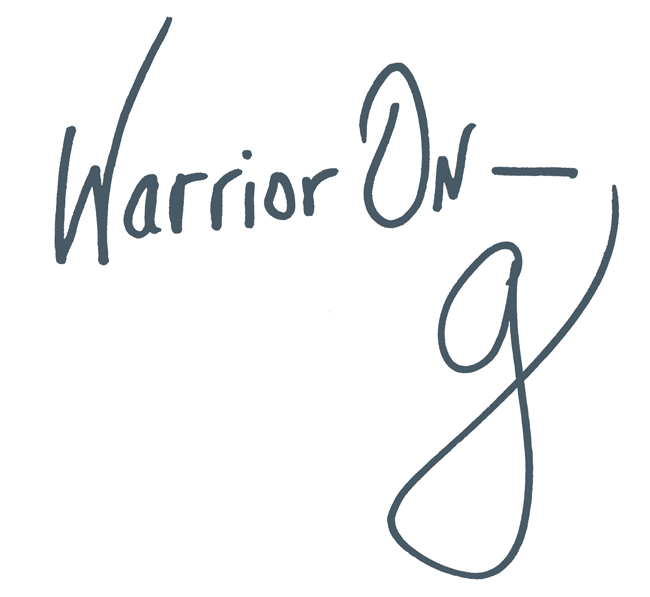 G: Sometimes when you’re the parent of a kid with cancer you feel like no one else gets it. The loneliness. The heartbreak. The uncertainty of what is next. If there will be a prom…a high school graduation…a first job…or grandchildren. Ever. Though we learn to live with this and we wouldn’t EVER trade them in for a healthy kid, the hurt is always there, just under the surface and the smallest little cut can make us bleed again. Your list and this poster have brought such sweet comfort. Knowing these precious ones are known, remembered, prayed over. Somehow we are less alone in our battle. Thank you! This–we wouldn’t ever trade them–so true. I wish I could take away my son’s pain but I love him exactly for who he is. I don’t think a day has gone by where he hasn’t made me laugh. For all the turmoil in his life, he spreads so much joy. And there is this mama, whose child suffers the torment of a mental illness, yelling in justified anger at the God who not only does not bring any relief after years, but whose comfort he cannot experience… whose child sometimes just wants to die from the mental torment and exclusion… And she cannot even hold him. Because the other issues, the sensory and “high functioning” autism-related issues prevent him from tolerating any touch of affection. This mama has not been able to hold her 19 year old through his pain since his age was in single digits. This mama wonders if… if it will only be when his life comes to an end, possibly through despair… that she will finally be able to hold him in a coffin. Please hear me. 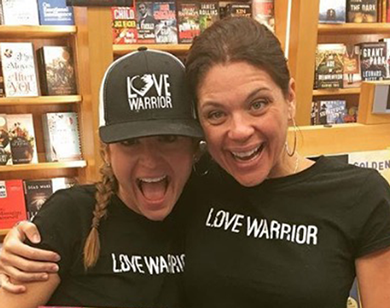 <3 Love to you, m.
You are a Kintsukuroi warrior mama to your Kintsukuroi child (look up Kintsukuroi, or kintsugi, if you haven’t heard of it…I first learned of it here). You are being heard and held here, and we are sending love to you and to your sweet, hurting one. I Hear you M. My heart aches wide open for you and your boy. m, I hold you and your son in my heart. Strength, love and light to you. I hear you. My heart is broken for your baby boy. (Because they are still our babies, right?) I am so sorry that you are denied even the comfort of holding him in his pain. I hope his name is on our list. But if it’s not, I will add it to mine. It can be “M’s boy”. Mental illness and depression are so cruel. So terrifyingly cruel. I hear you, M. Know that your baby’s soul hears you, even if his body or brain does not seem to. Know that you are loved just as much as you love him, under all the pain and fear. We love you. Thank you for your strength in mothering this boy who clearly needed you, needed to be mothered by someone who could face this. What a gift you have given to him to love him through this painful existence. He is so lucky to have you. I ache for you and your son. I cannot imagine how strong you have been forced to become. I honor you, I hear you. You are loved. m, I feel for you. Can you use a substitute stuffed animal that has a link of love in your mind for your 19 y.o. son, to hug? May sound silly, but something to hold onto and tell him how much you love him? A pillow with an old pillowcase of his? I think it’s impt. to grieve, to express your love in a tangible touching way, so it may help you. My love goes out to you, dear sister. My firstborn, called home to Jesus suddenly and too soon for my mamma heart. Claire was here. And she will always be loved. 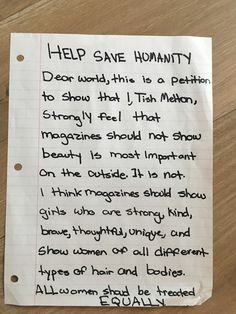 I heard you speak this in your live stream last week, and I’ve seen the posters and heard you explain them on other social media, yet I’m still teary-eyed reading this post. The way you write is like music, I feel the words every time I read it. Please always keep DO-ing, but also always keep TELL-ing. You bring us all to each other, but also help us tell our stories and explain our hearts better than we can. Thank you for this. i am a social worker and work specifically in the child welfare agency. 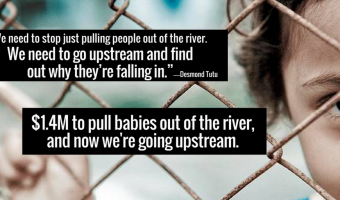 Everyday I see babies hurting, parents broken, and I try to make a plan to help. I sit with my moms and cry with them when they tell me they are trying so hard. I hug my babies and try to cuddle their neglect away bc they are just as large a part of my heart as my own babies. I take my teens aging out and I hug them and dance with them when they find something they’re passionate about, and I sit and listen and hold their hands when they blow up realizing home is never a place they can go again. Everyday I pour my heart over the streets of Cleveland, in each of these little houses and apartments, trying to spread healing and love and support. I myself have two babies (Lena Jo and Mac Richard) who are diagnosed with a chronic illness that leads to organ failure as transplant. I show them a life of humbleness and gratitude and putting good in the universe bc their tiny souls depend on the support and selflessness of others to live. It’s nice to read here that my kids names are prayed out loud and that kindness and love is fluid and reciprocal. Love on, G.